This Monday, I ran Mt. Baldy Run to the Top. 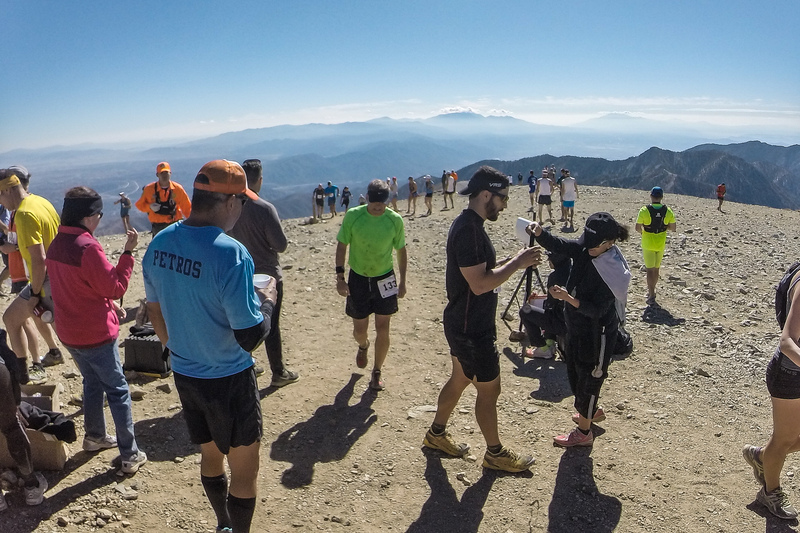 Baldy Run to the Top is an annual race held on Labor Day, starting at the Mt. Baldy ski lift. The course climbs 4000ft over 7 miles to the summit of Mt. Baldy at 10,064ft. This was the 50th anniversary of the race. I’ve hiked this course countless times over the last couple of years, but this was my first time participating in the race since 2010. This was also my first trail run in almost a year. I’ve been focusing so much on hiking and backpacking, that I haven’t really had the time or motivation to do much else. Even without any real training or baseline fitness, I figured I’d give it a go and hope that my time spent on the trails hiking would be enough. I arrived to the Manker Flats parking area at about 7AM, an hour before the race was set to start. It was already jam packed, and I could see countless runners warming up for the sold-out race. I made a quick dash to the registration table to pick up my packet, pinned my bib on, and met up with Julia, and my old friend from high school, Joel. We joined the mass of people gathering at the starting line for the singing of the national anthem. Just after 8:00 the gun went off and the race started. The first mile or so follows an asphalt road to San Antonio Falls. After this, the course heads up a fire road before reaching The Notch restaurant at the top of the ski lift. I was feeling pretty good at this point, and was still running. I thought I would be gassed at this point, but my energy levels were good. After leaving the Notch aid station, I tried to pick up the pace a little and passed a few people before reaching the narrow singletrack of Devil’s Backbone. As we passed 8,000ft of elevation, it became much harder to sustain a nice running gait, and my stride began to feel choppy. As we approached 9000ft and made our way through Baldy Bowl, I could see the finish line ahead of me. It was at this moment I was finally able to catch my stride again. From Devil’s Backbone to this point, I was maintaining more of a hike/shuffle, and could really feel the different muscles being engaged in my legs. After Baldy Bowl, the trail climbs steeply up the face of Mt. Baldy for a final ascent to the finish. I was really feeling the fatigue set in at this point, but was motivated by passing a few of the participants who were resigned to a slow walk upward. I reached the finish line in a time of 01:54:26 which placed 183/554. Not the greatest finish in the world, but not bad for someone who has done zero running in a year. This race has me motivated to do more running though, as it made me realize how much I love moving fast on the trails. I’m hoping to train hard and take at least 10 minutes off of my time for next year. One things I love about trail races is the sense of community. I’ve run a few road races and can’t stand the atmosphere. Trail races are a different event altogether, and are composed with a lot of the same personalities I meet while hiking and backpacking. There was an incredible positive vibe at the summit after the race with everyone enjoying water, Gatorade, bananas, and oranges. I take my hat of to the guys at Mercy Air who deliver all of this by helicopter. I’d also like to give a huge thanks to all the volunteers who donate their time on Labor Day to help make this race such a huge success. I look forward to seeing everyone again for the 51st edition of Mt. Baldy Race to the Top next Labor Day. Wow! That’s impressive! I always see trail runners and think they are so talented! Takes running to a whole new level! Wow this race looks killer!! Congrats! I’ve never done any trail running – I need to start getting into hiking more, though! Thanks, Shawna! This is one of the more challenging trail races in the area. Hiking really helps build strength for running on road and trail! wow, incredible photos and awesome race!! True. But then, I’d prefer to swim. I enjoy that more. I ran this race as an 18 year old just out of high school. That was in 1969. I finished either 4th or 5th. My time was 73:10. I also received a nice trophy. Cool race. I also ran the “Notch” race too. I finished in the top five. Good luck to all that enter this year.